One of the easiest and cheapest ways for to jump into the “connected home” scenario is with lighting. Smart lights simply replace traditional bulbs and offer more functionality usually via a bridge or hub. In the case of Wi-Fi lights, the extra functionality entails being able to control them from your smartphone or tablet device. These Wi-Fi bulbs are more expensive than standard bulbs, but will last just as long and offer much more control. There are a few different types of connected lights available today, from simple Wi-Fi bulbs that light up just like traditional bulbs, to colour changing bulbs that can do so much more. 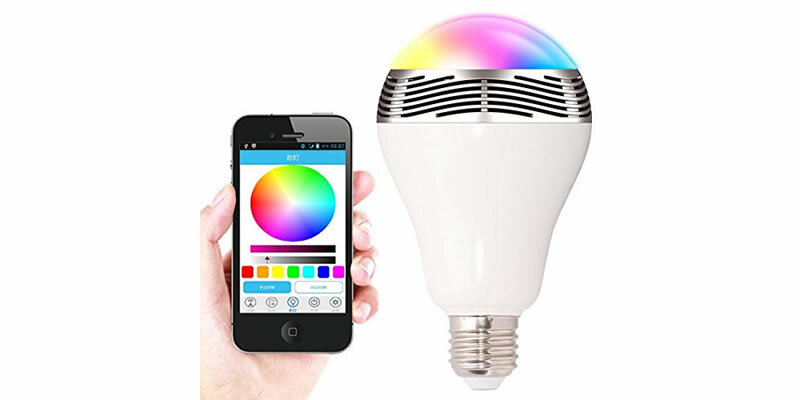 Wanway Wireless Bluetooth 4.0 Smart LED Playbulb Speaker – this bulb features an LED colour changing rainbow light show and can be controlled with a free App. It comes with a socket converter for bayonet or screw fit. In addition to the LED light bulb colours, this also acts a Bluetooth speaker to create an atmosphere for any occasion with and can be controlled from your smartphone. The bluetooth speaker in conjunction with the choice of thousands of colours is awesome, there is a powerful 30MM 6W driver for high quality sound and super bass and it works with all Bluetooth enabled devices. Easy set up too, just plug & play! Ctronics Wifi Light Bulb with Hidden IP Camera and Night Vision with Micro SD card – This item is controlled via an App which is available for both Android and iOS mobile phones and the iPad. The Micro SD card feature means up to 32Gb of video can be stored then played back from your phone. The camera has motion detection recording and can email an alert with picture when motion is detected! The night vision technology uses twin array LED’s with up to 50 feet infrared range. As if all that wasn’t enough, you also get one way audio for listening, plus of course it works a light too! Mi-Light Wifi Controller 4 Pack this pack includes 4 x B22 LED 6W multicolour bulbs for use with the Mi-Light Dimmable Wi-Fi Android and iPhone System. The Mi-Light LED B22 fits like any other B22 bulb, but offers a variety of other options including over 1.6 million colours which can be changed remotely using a Mi-Light remote or iOS or Android phone and the free app.